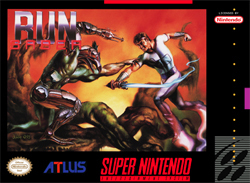 Run Saber for Super Nintendo has it up to you and the Run Sabers, genetically advanced humanoid warriors, to stop Bruford and restore order. As either Sheena, with her Ice Sword; or Allen, with his Thunder Sword, the fate of the world is in your hands as you try to stop the doctor's evil forces. If you're feeling overwhelmed by Bruford's minions, you and a friend can team up and work together to save the Earth from total obliteration.